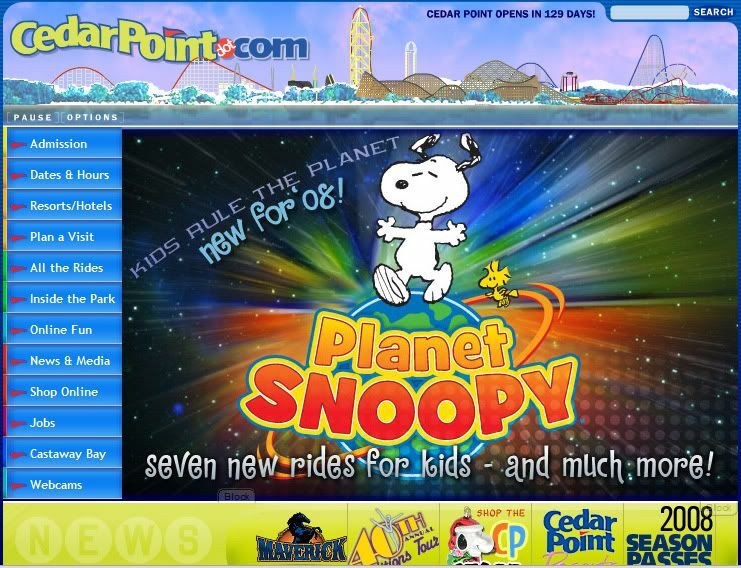 While at this moment there are no details, but it appears the Cedar Points main page is being updated with Planet Snoopy graphics. "Seven new Children's rides and much more!" You can see it on the home page in the first slide of the slide show.... here is a Screen Capture. Edit: just as I was posting it appears that Cedar Fair has pulled the graphic... I must have just caught it. ... And on a side note, does anyone else think the new "winter banner" at the top of the page looks more like a Tsunami than snow? Also, why are the rides still running? It's kinda funny lookin'. ^It always looks like that during the off season. Kind of strange the page came down. Hopefully it will be back up soon!! Nice Catch, Awaiting details, Of course if it involves some family oriented rides I'll be interested. I though camp snoopy was done well with a Tilt and things adults can ride. ... And on a side note, does anyone else think the new "winter banner" at the top of the page looks more like a Tsunami than snow? Also, why are the rides still running? Being a big Snoopy fan throughout my life, I love this. I too thought we'd seen the last of him. Having a 4 & 7 yr. old will also keep my interest spiked, (though the 7 yr. old has moved on to all of the big rides at the parks...she still loves the Beagle!). Am I thinking right in having heard this area would be taking over the "Peanut's Playground" across from Macaroni's?? I think it was Bryan at the GOCC psrty who said, Macaronies is also being rethemed into a kids restaurant. Instead of having a little section on the menu for the kids, there's going to be a little section on the menu for the adults. ...does anyone else think the new "winter banner" at the top of the page looks more like a Tsunami than snow? Also, why are the rides still running? It's kinda funny lookin'. Let alone the fact that if you Right Click > Zoom In you can see that Skyhawk has 4 swing arms and cannot be shut off, Mean Streak cannot be controlled, and Ripcord is permanently in the "checked" position in the Options menu. The original banner before additions was good. Ever since it has been a disaster. Wow. Just, wow. The things people spend time thinking about never cease to amaze me. Have you looked at what I said? There are also 4 "seat" sections that swing. Technically there are 8 arms, but there 4 seat sections, which overlap each other and swing at different times. Obviously it is an error. You're right. They should fix this error immediately. Have you called them? A new peanuts section? I was thinking if any large new kids area was being built at a CF park it would be with Nick characters. I've got an IM window open with the designer and his boss right now. We'll get this resolved post-haste. So, are they planning any new coasters for this Planet Snoopy area? I would love to see them put in a B&M flyer. That would be a perfect fit for Cedar Point. Yes, they are building a new coaster. What? I don't see Snoopy Planet on the top banner with four swinging/stationary arms. So confusing. It's amazing that Gator can post a comment on the banner, but when I do and point out other flaws with it, I get crap from it. I never said it was a big deal, I just mentioned other problems with it.